The entire image is 3 millimetres wide! 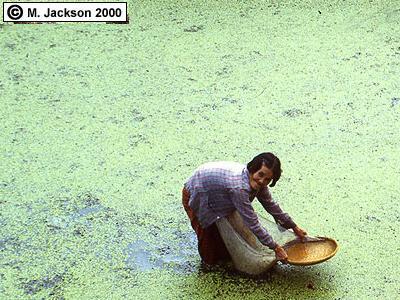 Photo of a woman, harvesting Wolffia by M. Jackson. This minute member of the Lemnaceae family was given this name by Cornelis den Hartog and F. van der Plas in 1970. It is found on the waters of China, India, Nepal, Hong Kong, Japan, Taiwan, Sri Lanka, Myanmar, Thailand, Vietnam, Indonesia, Malaysia, Philippines, Singapore, California, Florida, Colombia and Ecuador. This is the world's smallest flowering plant! It only consists of thalli; an undifferentiated vegetative tissue, and the minute flowers have only one stamen and one pistil. Although the seed are extremely tiny, it makes up more than half the entire plant. It is composed of about 40% protein, making it a very potential high-protein human food source. Recently reseats suggest the correct family actually is Araceae, making it related to the amassing Amorphophallus titanum! The entire image is 16 millimetres wide!